Vera Jourova, the European Commissioner for Justice, visited Cyprus on Friday as part of a “fact-finding mission” intended to give her a better understanding of the inner workings of EU-country citizenship by investment programs. Speaking to reporters in Nicosia on Friday, Jourova once more confirmed the European Commission’s intentions to issue recommendations to member states offering citizenship through investment and, on this occasion, specified November as the estimated month of release, according to the Cyprus Mail. “We had a good debate about the need to take all preventative steps not to allow bad people with bad intentions to enter the EU through such a scheme,” Jourova said, following a meeting with Cypriot Justice Minister, Ionas Nicolaou. Jourova reiterated that the commission fully respects a member state’s right to establish these schemes but that they should be aware that individuals granted citizenships also received all the rights of EU citizens. The report due in November will contain recommendations to governments, as well as standards on how to conduct checks on people applying for citizenship. The Commission will also invite the cooperation of Cypriot policy-makers before they issue the report. Jourova has also engaged in discussions with Maltese authorities regarding Malta’s Individual Investor Program (MIIP). Earlier this month, the Commissioner revealed some of the details to be included in the guidelines for citizenship by investment to EU countries, which chiefly concern enhanced due diligence on applicants and ensuring genuine links to their new countries. Jourova added that while the recommendations are not binding, ‘non-compliant’ countries could expect the EU to use “all legal and psychological tools” at their disposal to pressure these countries. 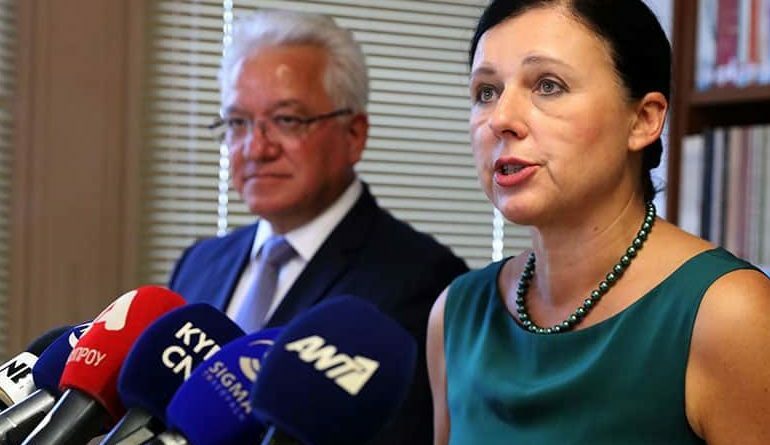 In an interview with Cypriot newspaper Politis before her meetings in Cyprus, Jourova said the EU cannot force member countries to abandon citizenship investment programs, although she labeled the practice unfair as it favors people with money. Asked about her opinion on giving out visas vs. passports in exchange for money, she mentioned that, in both cases, the security of the EU is at stake as the person granted the visa or passport gains free access to the EU, but that visas are for a limited time while naturalization is for life. Nicolaou said that Cyprus had no intention of granting citizenship to people linked to unlawful activities and that current measures went beyond those suggested by European directives. The country, however, was open to discuss any recommendations, said the Justice Minister.